There are now hundreds of videos exposing Illuminati control and Satanism in Hollywood. The evidence and proof is mountainous now and undeniable. See below. Last edited by Winston on May 30th, 2013, 12:09 pm, edited 3 times in total. Check out this 8 part series from Hollywood Insider about Illuminati motifs and themes in many movies. Wow. The common themes, motifs, colors, elements, etc. are undeniably connected. No one who watches this will claim that they are mere coincidences. No one. I can't believe how often the all seeing eye of Horus and pyramid appears in so many movies. It's also very educational. Everyone will learn something from this. Amazing documentary. Check this out. In the intro of this TV series "Otherworld" you can see the Eye of Horus in the beginning, and repeated zooming in on the Eye of Horus above the pyramid on the dollar bill. Here at the end of the first episode, just before the credits start rolling, notice how the camera zooms in on the Illuminati/Freemasonic Eye of Horus again inside the pyramid shape. In "2001: A Space Odyssey" they also show the Eye of Horus numerous times. Near the end, you see the eye changing colors as Dave is floating into the other dimension. Here is the scene. Last edited by Winston on October 23rd, 2010, 2:54 pm, edited 1 time in total. Check out this 2 hour documentary about Illuminati symbolism and occult motifs in Hollywood movies, from past to present. After you see what's presented, there will be no doubt in your mind that the Illuminati controls Hollywood. It's crystal clear when you see all the examples. 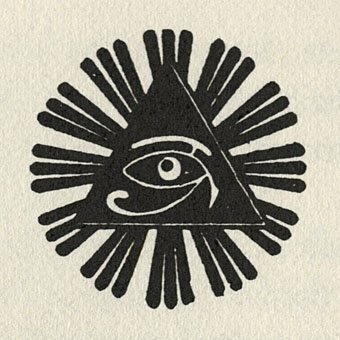 In nearly every film related to sci fi or fantasy, the all seeing eye of Horus from the back of the dollar bill is used for some reason. It's freaky. This can only mean that either movie directors or Hollywood visual design specialists (or both) are in on occult secret societies for some reason. You should check out Ke$has video - "Die Young"! Its loaded with signs and pyramids galore. A WOMAN'S THOUGHTS DO NOT DEFINE A MAN; NOR DO HER EXPECTATIONS DICTATE HIS LIMITATIONS! 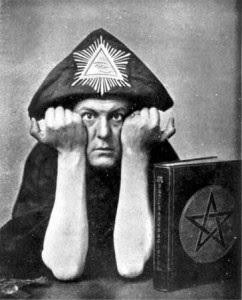 Winston wrote: Also, I wonder why the Zeitgeist films put Illuminati symbols in them. Because the venus project is an Illuminati backed project. I would have thought that was obvious by now. By the way....I was in the store here in germany and they sell wine by the Illuminati winery in italy...pretty good wine too!! Hey, they have a facebook too. 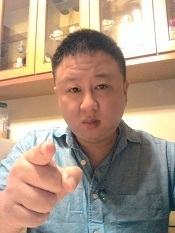 Feel free to check out my blog:Click ME! The top left image below is from the Star Trek episode "Is there in truth no beauty?" 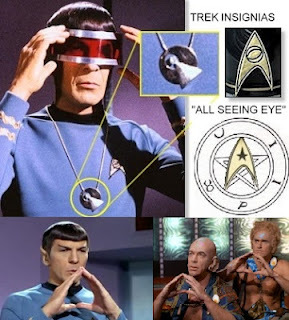 Notice that Spock is wearing an Illuminati/Freemasonic pyramid pendant around his neck. You can even see the all seeing eye of horus at the top of it. It's the same pyramid symbol that's on the back of the dollar bill, in many corporate logos, and in many movies as well. The connection is unmistakable. In this slide show below, you can see many more examples of Illuminati symbolism in Star Trek and Star Wars. Check this out. Even Russia Today is controlled by Illuminati. Here is the evidence and signs. This is very creepy... What do you all think? Is there something to this? I dont get something. Why did Disney put out wholesome movies before in the 50s, 60s and 70s, if its illuminati or satanic controlled? Also why did Hollywood put out wholesome shows like "Little house on the Prairie" before if its illuminati controlled? Winston wrote: I dont get something. Why did Disney put out wholesome movies before in the 50s, 60s and 70s, if its illuminati or satanic controlled? Also why did Hollywood put out wholesome shows like "Little house on the Prairie" before if its illuminati controlled? Then you never heard of the concept of the frog in the pot of water. Things must change slowly and gradually so their hand is not given away. You can't turn a boat sharply. You must turn little by little. I can't believe this, Winston. Stop resisting. A good man is above pettiness. He is better than that. "The Jews didn't start getting a good grip on Hollywood until late 60's and 70's and even then they slowly became more dominant over time whereas by the 90"s and 00's their influence over most TV shows and movies were complete. I would say the 90's were a major transition period as you can still find shows that were old school format mixed with the Jewish denigration type shows. Christians owned a majority of the media up through the 60's, that's why there were so many rules about what you could or could not do in them, even a comic book code! Then the Jews started getting more influence in the late 60's and that's when you started to see more risqué movies and after they were introduced everyone else had to match to keep up. I think the first movie that broke the barrier was that motorcycle movie with Jack nicholson, I forget the name. Jews were around of course with the inception of modern media, they just weren't dominant, it took a few decades. Hippie movement was supposed to be a trike horse but it didn't go the exact way whoever initially instigated it. I watched or read a documentary about it but can't remember the source."